SAN BERNARDINO, Calif. /California Newswire/ — Employees of Northwest Pipe, a leading manufacturer of welded steel pipe, have completed the San Bernardino County Workforce Investment Board (SBCWIB) process improvement program. Completion of this program has done more than increase employee productivity and safety, it has created new jobs. Northwest Pipe enrolled 12 employees, including both management and staff, in the training program focused on technical and safety operations. Each participant was trained using Simple Organizational Excellence Methodologies to systematically and continuously improve their business operations by reducing waste and increasing operational efficiencies. By reducing waste, a company can improve employee safety, production output, production capacity, and employee morale. According to Amy Byrnes, Northwest Pipe's Human Resource Manager of the Adelanto Facility, the Workforce Investment Board training gave Northwest Pipe an effective foundation for their employees to improve job productivity and safety. "The training has had a concrete impact on overall safety in our workplace; a goal established by our top management for each individual employee. The technical knowledge employees received from the program has supported greater productivity, and that has helped us grow. We have added three temporary positions, which we hope to convert into full-time positions." The Workforce Investment Board provides this and other training programs for businesses in San Bernardino County at no cost, to support employment opportunities for local residents. "The Workforce Investment Board's training programs serve County businesses and our community by upgrading the skills of our local workforce and helping local companies thrive," said Sandy Harmsen, Executive Director of the Workforce Investment Board. "The training programs are one of the many ways we support local businesses and their employees." Northwest Pipe's executive management plans to send additional employees to the training. This type of training is just one of many resources the Workforce Investment Board offers employers, all of which Northwest Pipe has successfully utilized. "We value the Board and its support, information and services, especially its recruitment services when we have open positions to fill," said Byrnes. "The training helped our employees feel valued and demonstrates we are investing in them, so it has also been good for morale. Improving morale, productivity and increasing safety is great for helping our company thrive and grow." 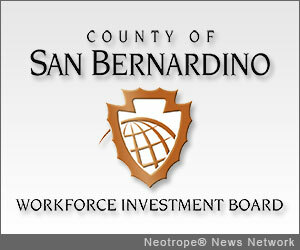 "The training programs offered by the San Bernardino County Workforce Investment Board demonstrate how we can partner with local businesses to help them improve productivity, enhance worker safety, and ultimately create new jobs," Chair Janice Rutherford, County of San Bernardino Second District Supervisor said. Services such as process improvement consulting, employee training, On-the-Job training, and recruitment are available free to businesses in San Bernardino County through the Workforce Investment Board. For information on upcoming training classes, contact the local Employment Resource Center or call (800) 451-JOBS; visit www.csb-win.org. Northwest Pipe Company is a leading manufacturer of welded steel pipe and tube products. The Water Transmission Group is the largest manufacturer of engineered steel pipe water systems in North America. With five Water Transmission manufacturing facilities, the Group is positioned to meet North America's growing needs for water and wastewater infrastructure. The Water Transmission Group serves a wide-range of markets and their solution-based products are a perfect fit for applications including: water transmission, plant piping, energy, tunnels, river crossings, structural, industrial and construction. The Tubular Products Group operates three technologically-advanced ERW (Electric Resistance Weld) mill facilities. Tubular Products portfolio serves a wide-range of markets and its quality certified pipe and tube products are good for applications including: oil and gas, structural industrial, fire protection, low pressure and agricultural. The Company is headquartered in Vancouver, Washington and has manufacturing facilities in the United States and Mexico. For more information, visit http://www.nwpipe.com/ .